The Molecular Integration in Neurological Diagnosis (MIND) Initiative is a new cross-departmental initiative at the Perelman School of Medicine at the University of Pennsylvania. OUR MISSION: To usher in a “molecular era” in which patients with neurological diseases will be characterized at the DNA and biomarker levels, in order to improve clinical care and accelerate therapeutic development. Common neurological diseases such as Alzheimer’s Disease, Parkinson’s Disease, multiple sclerosis, epilepsy, and others are using “working definitions” that are decades (or even centuries) old. For example, Parkinson’s Disease was clinically defined more than 200 years ago, and the brain lesions we still use to characterize this disease were first described 100 years ago. 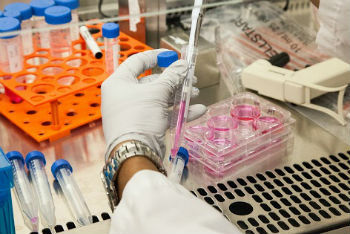 At the same time, the rapid pace of technology development allows us to look at individuals at a “molecular” level – to understand what specific changes in DNA a patient might have, to define biological markers (or “biomarkers”) from patient blood, cerebrospinal fluid (CSF), or other materials. Moreover, this DNA and biomarker information may allow us to tailor existing therapies at the individual level, allowing for “precision medicine,” and to identify which particular patients would be most likely to respond to experimental therapies. Right now, there is a disconnect between the way neurological diagnoses are still made and the promise of these new molecular tools. The Molecular Integration in Neurological Diagnosis (MIND) Initiative at the University of Pennsylvania will close this gap. Molecular tools to characterize DNA and biomarkers (often called genomics – for DNA – or proteomics – for protein biomarkers) from neurological disease patients can vastly improve diagnosis and clinical care. Molecular characterization of neurological diseases will expand our understanding of the disease process and lead to the development of novel therapies. Molecular tools can offer guidance at the individual patient level. Right now, patients are grouped by disease, but the same disease may look different in different people. All patients should be offered the chance to be molecularly characterized. Knowledge is valuable, and this knowledge should belong to both the researchers and patients who want to learn more about themselves. The MIND Initiative is enrolling patients for its Parkinson's Disease project now! If you would like to learn more, please contact us via email at MINDinitiative@pennmedicine.upenn.edu or Phone or join our mailing list below. The MIND team started DNA extraction from blood samples that have been collected at the Penn Parkinson’s Disease and Movement Disorders Center. That DNA will then be sequenced for genetic testing. MIND Initiative kicks off its Parkinson’s Disease project!